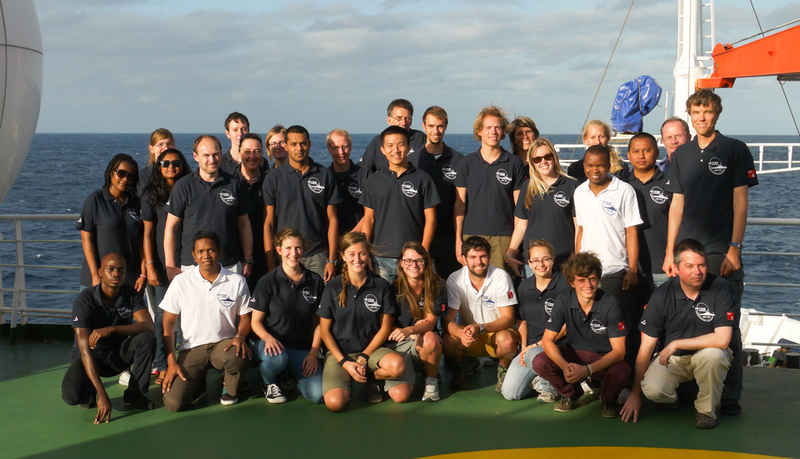 The third and final week of our voyage brought us from the Agulhas Current toward Madagascar. The island of Madagascar is centred at 20°S, thus directly in the way of the westward flowing waters coming from the Indonesian archipelago. Along the eastern coast of Madagascar, the South Equatorial Current bifurcates and partly forms the South East Madagascar Current. South of the island, the current detaches from the coast, peeling off as eddies. These eddies drift westward and form part of the source waters of the Agulhas Current. We surveyed one of these eddies during transit with a series of Underway-CTD casts at high temporal resolution for 24 hours. In combination with the Ship-borne ADCP, the origin and water characteristics of the feature were studied. We arrived at the third study area, south east of Madagascar, in the early hours of Friday. Three Bongo-nets and 6 CTD casts down to 2000 m were undertaken to survey the South East Madagascar Current. Plankton diversity was high, and many species were caught in the nets. However, the abundance of organism is less than in upwelling zones. Lack of biological activities in the surface waters result in deep blue seas. The subtropical sun provides air temperature in the low 20°C’s. Throughout the entire cruise, biogeochemical parameters at the sea surface were monitored. Carbon dioxide (CO2) and methane (CH4) concentrations were recorded every second and seen real-time on the monitors. In addition, the isotopic compositions of CO2 and CH4 were measured, not only to understand the exchange that takes places between these greenhouse gasses and the surface, but also to understand the processes that regulate the exchange. Since these processes depend on the pH and the oxygen concentration of water, these variables were also continuously measured. After 17 days (or 24480 minutes) at sea, the 6 principal variables and additional measurements (such as wind speed, pressure etc.) we measured comprise a large dataset which we are looking forward to analysing. Over the last hours, we collected and completed all post-processing of the measurements, packed all instruments into containers, wrote reports and cleaned the various laboratories. We are looking back at a successful and harmonious voyage. The mood on board continues to remain jovial. The collaborative work with the capitain, Michael Schneider, the bosun, Peter Hadamek, and the entire crew of METEOR has been commendable. In this week’s report, we particularly thank Tilo Birnbaum-Fekete, Heike Dugge, and Marco Reinstaedler for their amazing manoeuvring skills whilst on station. Greetings from 21°S, 56°E, north of the volcanic island of Reunion.